I remember being interested in Dracula Unleashed when it was released, despite not really knowing anything about it, or chasing down information in the gaming rags. An FMV adventure in the world of Dracula sounded like something I’d dig. It turned out to be one I never got around to picking up, and so to finally be able to play it now… well, I’m glad I had decided to instead spend the $50 on some VHS movies or loose women. As you can guess by the title, this is a gothic tale based within the Dracula mythos. You play as Texan Alexander Morris, roaming about London and looking into your brother Quincy’s death. Along the way, you’ve met and engaged a beautiful young debutant. The game picks up as you get accepted into an odd social society called the Hades Club, and more strange deaths occur around you and your friends. As you progress, you’ll meet most of the staple characters from Stoker’s novel, involve yourself a little too deeply in their world, and eventually face the Big D.
I do believe I’ve overheard a clue. 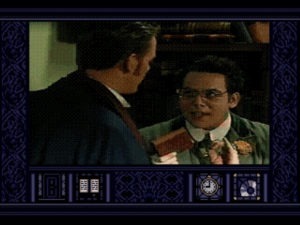 Dracula Unleashed was made by the same team behind the Sherlock Holmes Consulting Detective series (and an in-game newspaper even contains a Sierra-like reference to that game). Unsurprisingly, the gameplay is exactly the same blend of FMV clips and a limited interface to trigger them. The entire game is driven by a row of icons along the bottom of the screen, where you can access your journal, travel map, and a few other options we’ll cover in a minute. These icons don’t really control your investigation so much as control the playback of the next video clip in a roundabout way. Every location you can visit is a 2D still containing a carriage and a single door to the building where the person you’ve come to see resides. The carriage takes you back to the travel screen. 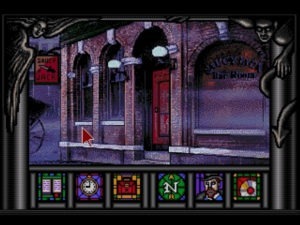 The door plays a non-interactive video clip based on your current progress in the investigation. That’s it. You don’t pour over scenes and uncover clues. You don’t interrogate anyone with questions of your choosing. 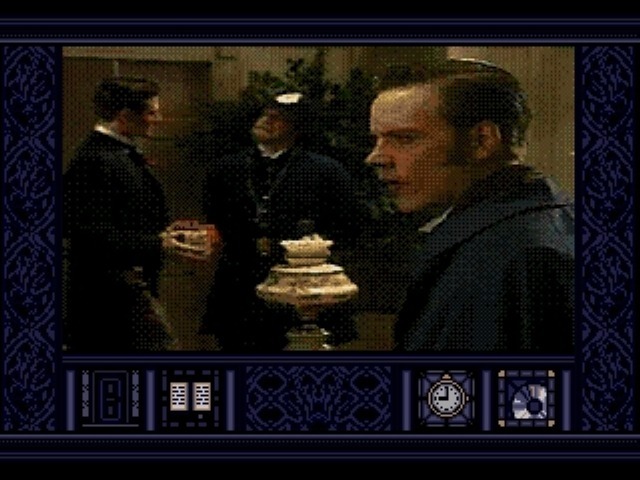 It’s the same hands-off investigation as the Holmes games, with only a few surface improvements. It’s important to drive that point home. There’s very little investigating that you’ll actually do, especially when you’re not required to make the kind of deductive leaps required in Consulting Detective Vol 2. That at least could justify some brain power. Here, you have but one correct choice in a linear sequence. If you pick the correct building, you get a clue and a suggestion of where to go next. If you pick something out of sequence, you’ll get a generic “piss off” video, where the building super or whatever shows up and tells you such-and-such isn’t home right now, come back later. Make enough wrong moves, and you’ll eventually get killed. This effectively ruins any chance you have to explore on your own, or define your own path through the story. Seriously, it’s no different than following the linear order of a book, and makes this title more of an interactive gothic novel than a proper game. Instead of using your fingers to turn the page, you’ll use them to click to the next scene, and receive the same level of interactivity for either. Granted, this does not mean that you don’t have to pay attention. London’s a big place with lots of addresses to explore. Each address is for a single contact (and their corresponding video) with some characters holding two addresses depending on the purpose of your visit. Time is the mechanic used to keep you on track. Every location takes a certain amount of time to travel to, and each video clip, lasting around 30 seconds in real time, may take hours of game time. Waste too much time going to useless locations and you’ll get killed, or you’ll be unprepared for the inevitable scene where you’ll get murdered if you don’t have a certain item by that hour. It’s not quite as thrilling as it sounds, because time here really just exists to prevent you from blindly clicking your way through the game (which you could easily do otherwise). The idea thus becomes to know why you’re going to what place and travel there with efficient intention. If you take too long to solve the mystery, and you’ll be too late and forced to start anew. The D-pad to moves a cursor around the screen and lets you click a series of icons with the controller buttons. Icons include a pocket watch and a map of London with marked travel times, both to keep you abreast of your leaking daylight. You have a diary you must click on to “write” out a new observation after important FMV scenes. If you don’t click the pen, you miss the opportunity to have that note later. I suppose this is idiot-proofing to ensure you’re following along; it’s the only reason I can think of to require you to activate the diary instead of having the entries fill up themselves in the background. You can save at just about any time a video isn’t playing, which is infinitely helpful in a game where you’ll have to backtrack to win (once you realize, through death, that you’ve meandered too long in the wrong part of London). Finally, should you need to learn the use of the icons, you can activate a guided tutorial from Van Helsing, with a terrible, terrible attempt at a German accent. Now take this book. And don’t forget to take it again when you leave. The final icon controls your inventory, whose use is uncommon due to the limits of FMV. Basically, you can sometimes influence the clip that plays at a location by “arming” the correct item beforehand. You’ll gain these items by checking this screen after a clip plays and picking up the item present in the “in” box – you’ll never need to search for them at the location stills themselves. You’ll also need to check this inbox after just about every FMV, since items you’re given within the video itself aren’t actually given to you until you leave the video screen, move outside the building, and then accept the item from the inventory screen. And don’t count on it waiting there if you forget and leave. The whole inventory system is a bit confusing since you’re not really using or finding these items, and the item-setting requirements are rather rare anyway. They will mostly be another source of death, and possible trial-and-error on your part to determine what you need, when and where. The acting is over-the-top, but your typical camp. The video quality even manages to behave itself in most cases. Images will still break down into large crosses of identical pixels, but you can at least understand characters, faces, and actions on the screen. The show overall is a bit like a soap-opera, both in camera shots and sound selection, but I suppose that could be considered part of the charm. Serious adventure fans will have blown this title off by now, so I’m assuming if you’ve read this far and are still interested, you won’t mind a mildly-cheeseball production with frustratingly limited gameplay. If you can suffer through the time restraints, the provided video will be satisfying, and the story will do its job. 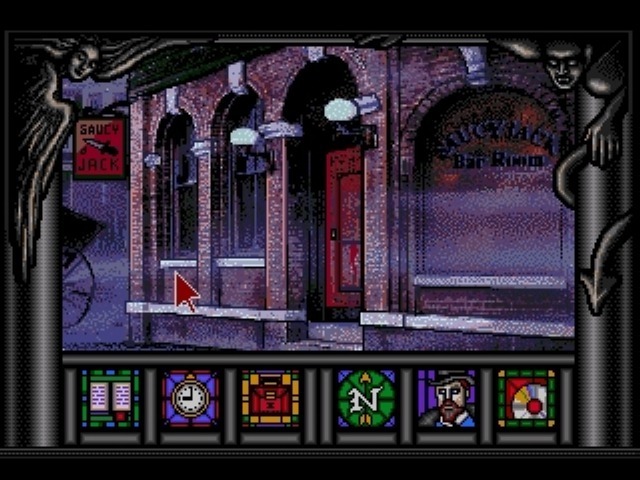 Otherwise, if you’re a die-hard fan of Dracula mythology, you might enjoy playing through this once. Just don’t expect to actually discover or do much on your own. This is more like playing the fatalistic part of an actor going through the motions of fulfilling a predetermined script, and the limits of FMV make this one of the more restrictive adventure games you can find. A little more coherent and easier to follow than the Holmes games. Pretty good Dracula tale. Icons basically select the next FMV clip to play, so not much of a game here. You might actually have more fun by simply following a walkthrough. You’ll get right to the story without the aimless stumbling around.